Ancient Roman sites can be found scattered in across several parts of the globe. At its peak, the Roman Empire encompassed more than 20 of the modern-day countries around Europe and Africa. Some of these included England, Spain, France, Lebanon, Morocco and Algeria. While many of us may be aware of the extent of the Ancient Roman Empire, it’s easy to forget that you don’t necessarily have to visit Rome to get a glimpse of some of the remains of imperial Rome. Here are 8 Ancient Roman archaeological sites that you can find in Britain. Chester Amphitheater is the largest of 19 known Roman amphitheaters to be uncovered in Britain. The theatre is believed to have been constructed around 70 AD and was used mostly for cockfighting, bullfighting, as well as boxing, wrestling and gladiator combat. The Chester Amphitheatre measures 98 meters (320 feet) in length and 87 meters (286 feet) in width, and could comfortably seat 8,000 people. Surrounding the theatre itself is a complex of dungeons, stables and food stalls which supported the amphitheater’s events. Due to the unusually large size of Chester Amphitheater, some speculate that Chester would have become the Roman capital in Britain. The theatre fell into disuse around 350 AD during the Roman departure from Britain. It was rediscovered in 1929. The Roman Baths are among the best known and best preserved Roman sites in Britain. 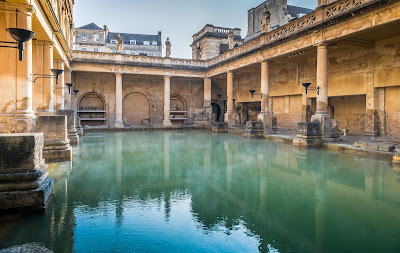 The Baths attract over 1 million visitors each year, making it one of the most visited historical sites in the United Kingdom. The ancient bath and spa is constructed on top of unique geothermal springs. This provides natural heated water flowing through the baths at a rate of 1.1 million liters each day. The water still passes through its original lead piping and is considered unsafe on the basis of radioactivity and infectious disease. 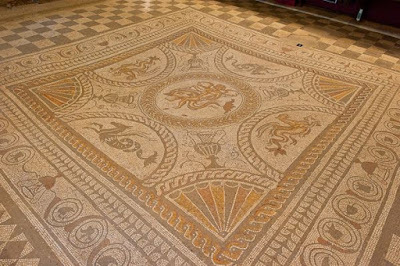 The Fishbourne Roman Palace & Gardens it the largest residential Roman building in Britain. The palace features large rectangular gardens and an extensive collection of intricate coloured mosaics, including the perfectly preserved dolphin mosaic. The Roman villa was first excavated in the 1960s and was so large that it became known as a palace. The palace began construction in 42 AD and consists of 4 residential wings surrounding an open courtyard, a huge assembly hall, under-floor central heating, and a bathhouse. The formal gardens were elaborately created and boasted complex shaped hedges, trees and shrubs, and a water supply for fountains. In 270 AD, a fire destroyed the north wing of the palace. As the damages were too great to repair, the palace was abandoned. They say that all roads lead to Rome. During nearly 4 centuries of the Roman Empire in Britain, the Romans constructed roughly 3,200 kilometers of paved roads, providing infrastructure for movement of goods, trade, and of course – quick passage for military troops. Roman roads usually measure 5 to 7 meters wide. The Roman Road Network. Image source: Wikimedia Commons. The national road network was constructed by engineers of the Roman army, taking into account key locations, manned way points, and impermeable design to make the roads useable in all seasons. 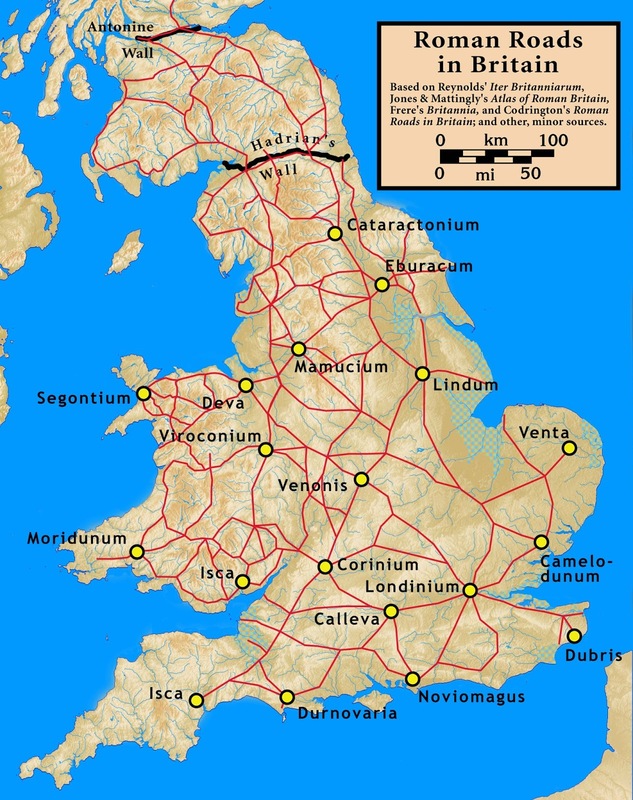 The Roman Road Network remained the only nationally managed highway system until the 20th century. Today, many of the roads are part of the UK national road network, while others are archaeological sites or have been lost. 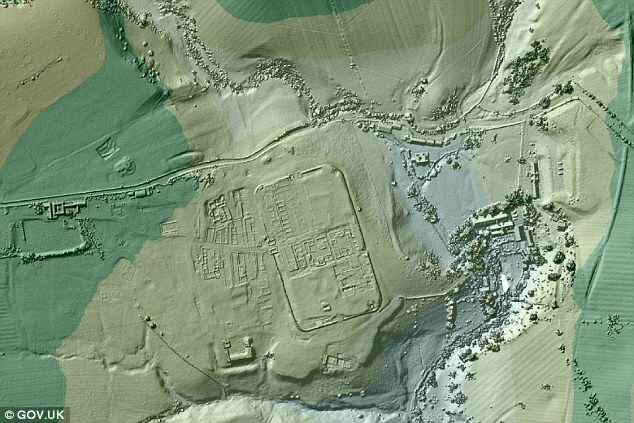 These Roman Roads were recently discovered using LIDAR (light & detection ranging.) Image Source: Environment Agency Open Data. Vindolanda from above. Image Source: Hadrians Wall Country. At the northern frontier of the ancient Roman Empire, Vindolanda is a Roman fort which stands to the south of Hadrian’s Wall. Vindolanda is one of Europe’s most active archaeological sites, with excavations taking place every year. The remains of the fort include officer’s residences, barracks, village houses and workshops, a temple, and a bathhouse. 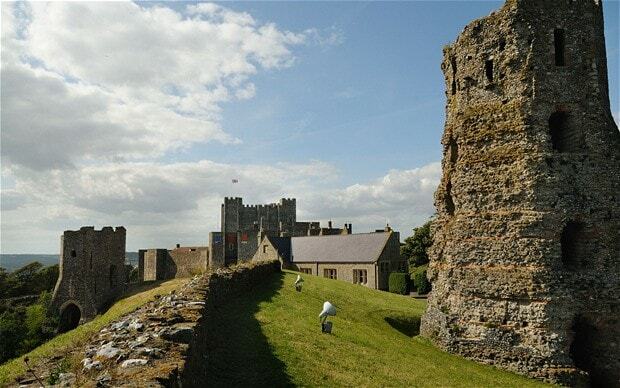 After the end of the Roman occupation, the fort remained in use for 4 centuries until being abandoned in the 800s. Hadrians's Wall at Willowford. Image source: Own work. This 100 kilometer wall stretches across Britain from coast to coast. 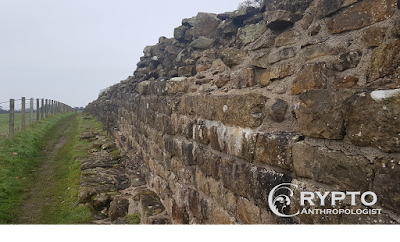 Built by Emperor Hadrian, the wall marked the northern frontier of the Roman Empire. The wall was built by 15,000 infantry men over the course of 6 years. 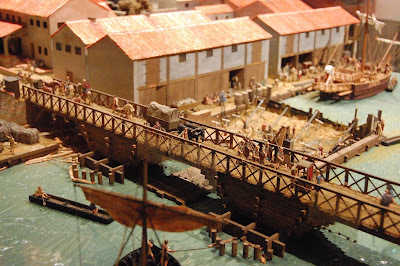 Model of the Roman London Bridge over the Thames. Image Source: Steven G. Johnson; Wikimedia Commons. London Bridge, over the river Thames is one of the iconic landmarks of London. While the current London Bridge was opened to the public in 1963, it replaced a 19th century arch bridge, which had itself replaced a 600 year old medieval bridge. Prior to this, the first bridge that stood in its place was built by the Romans. Remains of the Roman Lighthouse. Image Source: The Telegraph. The Roman Lighthouse at Dover Castle is said to be the oldest building in England. The present castle stands on the site of an ancient Roman Fort. The Roman Lighthouse is one of the best preserved of its kind anywhere in the world. The lighthouse originally stood 24 meters (8 storeys) high, though only 4 storeys remain today.